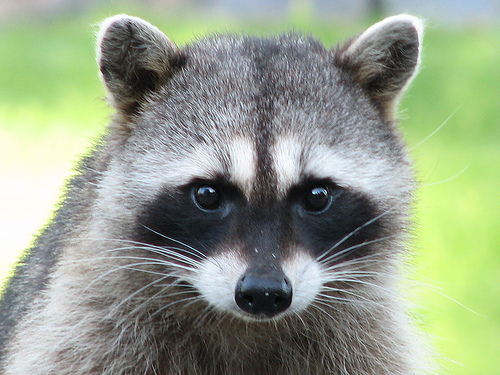 Confession: This story is true, but was refreshed in my mind by reading Jenny Lawson (The Bloggess) “Let’s Pretend this Never Happened”, in which she reminisces about having a pet raccoon (very funny read). I have never been very good with directions. Whether it be reading the directions or following the directions, I am a bit direction dyslexic. The G.P.S. was probably made for people just like me. So when, at the age of 16, my mom’s minivan tire blew out on my way to my friend’s house, I was not at all surprised to find myself completely wandering around. I suppose I would have had some sense of direction if I had actually not taken a wrong turn going home. I was a very hot summer day, yet here I was, ironically wearing a sweatshirt and heavy jeans. I got out of the van and started in a random direction down the street. This was way before cell phones were common, so I had no lifeline. After a short while I found myself walking along a bridge….I didn’t know what bridge. The longer I walked, the hotter and more completely desperate I got. I had no idea where I was, but I knew I wasn’t on the best side of town. Tears began to fall as my steps grew labored. Always warned of the dangers of strangers I gave him a cautious look that said, “I could use one…but only if you agree not to be a psycho”. I slowly climbed into the wagon and sat as close to the passenger door as I could. The man was older and brown bearded. I notice a slight skin deformity on his right arm. That’s when I casually looked down and noticed a raccoon in a cage on my floorboard. While silently praying for my safety, I told the man where my friend lived and sat tight….all the while shifting my eyes and surveying this strange predicament. When we pulled up at my friend’s house I kindly thanked the eccentric, ‘Touched By an Angel’ raccoon man. He saw my desperation and came to my aid. I don’t know where I would have ended up if I hadn’t accepted his ride. It brings to mind the other poor souls I may have passed up through the years, too scared or too busy to stop and help. It also reminds me that God, who is merciful, directed this man my way, and God, who has a sense of humor, knew that this would be enough to remind me to NEVER hitch hike again.